Feed your Anomia addiction! 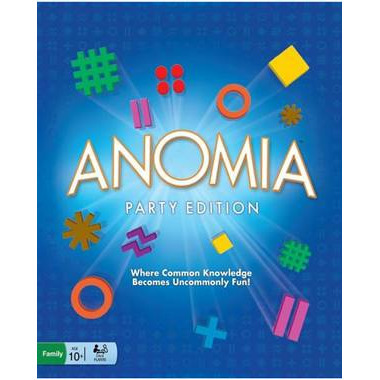 Diehard Anomia fans and novices alike will love the Anomia Party Edition, featuring 6 all-new decks and over 425 unique categories, plus customizable bank cards for adding your own categories in every deck! For 3-6 players. Suitable for ages 10 years old and up. This is a great game for a bunch of friends or family! It's easy to learn and the party edition allows for more play before reusing cards. The wild cards add another element of fun and having to keep on your toes. Anomia is such an amazing game! It's super easy to pick up on, and you can play it with anyone, anywhere! This party edition really just expands the options, which is great for playing with the same people frequently. Excellent!